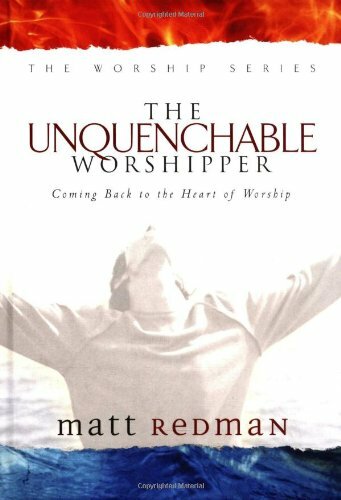 I am just one chapter into the book "The Unquenchable Worshipper" by Matt Redman, but am already finding my heart shaped when it comes to the idea of worship. Our culture has turned worship into a happy-go-lucky event that happens an hour a week on Sunday mornings, when it is really so much more. Worship really has nothing to do with how we are feeling. Worship is a response to all that God has done for us and for creation. Therefore, in the midst of the best or worst of times, we must continue to worship and resist the quenching of our spiritual fire. Perhaps the times of utter despair should be the times we turn to God in worship the quickest. May we be people who fail to let the burdens of this world, and sadly, often the burdens of the church, quench our spiritual fire and keep us from worship. May we press on in praise of our God and Savior. While I am the first to declare that when God wants to get His point across He will be very blunt and keep presenting you with His will, I also am learning about the incredibly hard journey it is to be a disciple of Christ. We often get absorbed with whatever is easy and comfortable and never dare to let God be in control of our lives. We say He can do whatever He wants, as long as it isn't too inconvenient. What kind of people would we become if we actually allowed God to fulfill His purpose in us? What kind of revolution would we lead if we actually had the guts to listen to God and do what He wants for us? Jesus never claimed that following Him would be easy (in fact, it often leads to embarrassment, poverty, and sometimes death). But he DID declare that living the kind of life he spoke of would be the best possible way of living, a full life, an abundant life!! May we be people who don't always look for the easy way out. May we strive to follow Christ more closely than we ever have before. May we experience the full, abundant life of the Kingdom of God here on earth. WE SERVE A PERSISTENT GOD!! It is amazing how stubborn and hard-headed we can be about change in our lives. I am continually amazed, yet thankful, that God is more stubborn and more persistent in chasing us down when change must take place. In those times of my life where God is trying to do something huge, it is God's repetition of the message that typically proves successful in providing change. In the last couple weeks, God has been diligent about speaking to me regarding the busyness of my life. I even wrote in my blog a month or so ago about the need to say no, but I did not heed my own advice. In the last couple weeks I have read a book called "What Matters Most: when No is better than Yes" and heard two sermons on the need to re-prioritize my life. Coincidence...I think not!! When it comes down to it, it is not about never being busy, but knowing how to schedule your life in order to provide ample time for rest and recovery following busy times of life. Our lives are full of peaks and valleys of busyness and rest, and a lack of respect for these times of rest can prove costly to our health, physically, emotionally, and spiritually. Do you ever find yourself saying the phrase, "I love doing ______, but I just haven't had time in a couple years."? There is something fundamentally wrong with that statement, because if I were to ask you if you have really enjoyed all that 'stuff' that you have been doing instead, you would probably say "no." Why is it that we don't take time to do the things that would really give us energy to push on through the busyness of life? Why is it that we will do a million things that we don't really want to do, but will never take time to do the things we love most in this world? May we be the kind of people who really know how to work hard and accomplish much in the name of Jesus, but who equally know how to rest hard. May we respect ourselves and our Creator enough to honor the way he created us biologically. May we figure out what in our lives is most important and what could easily be eliminated, and have the strength to actually get rid of some stuff in our lives that isn't needed. And may we hold each other accountable, in our words and prayers, to be the kind of people God has created us to be. God Bless!! It is amazing that only one chapter into the book of John, the author is already hitting it hard and we already have a promise of salvation. For those of you on this journey through the book of John with me, we are going to have a ton to wrestle with in the next 3 weeks. I can't wait!! It is interesting the language used of Jesus in the first paragraph. In verse 4 we see that Jesus was an integral part of the creation process. I had always known this, but the phrase "In him WAS life" really caught my attention this time through the passage. Further into John we will get the promise that Jesus IS the life (14:6). It seems that the only reason Jesus can BE the life is that he has always BEEN the life. How uplifting it is to know that the one who is providing us life on a daily basis was the author of life and has been providing life everyday since. I think he probably knows what he is doing. In the book of Hebrews we get this image of Jesus as the great high priest, the one speaking to God on our behalf. How amazing to know that our mediator was "in the beginning" and "became flesh and dwelt among us." As I continued to read, I was struck by the level of humility in John the Baptist. Often people in ministry can get a big head and think that the ministry is all about them. John showed no signs of this whatsoever. In biblical times the majority of roads were simple trails that were not well maintained. When a king would come to a region, though, the roads were smoothed and straightened out for the one to come. John humbles himself by saying that his purpose is only to prepare the way for the coming King, Jesus. John goes on to say that he is not even fit to untie the sandals of the coming Messiah. To untie someone's sandals was the work of a slave, so John is saying that he is not even worthy of being Jesus' slave. John understood that being a disciple of Jesus was not about himself, but was about getting out of the way so that Jesus could be seen more clearly. Often we simply get in the way of the work Jesus is trying to do. We try to look too cool or look like we know all the answers or look like we are in charge, while Jesus is put on the backburner. May we be people who could care less about ourselves so others would care more about our Savior. May we be people that prepare the way for Jesus and then get out of the way so He can do His work in people's lives. First of all, we had a fantastic trip!! What a relief that everyone came back to their families safe and sound. We only had one big miscue, when David lost his luggage. He was a pro about it, though, so that made it nice. We were staying in a cockroach infested, mothball-smelling dormitory where you couldn't even flush the toilet paper after using the facilities. But surprisingly, everyone rolled with it pretty well. It probably didn't hurt, though, that the site ended up having a pool that we could relax in each night. It was great to come together as a group each night and spend time devoted to God in song, reflection on the day, Scripture reading, and prayer. We were able to accomplish a ton while we were in Panama City. The men and some of the ladies worked with a construction crew from Panama to build a new and safer fence around a preschool and daycare and to build and pay for a roof over a school playground to prevent flooding during the 8-month rainy season. To get this fence up, we first had to dig down. The first day was spent digging a huge trench, 2 feet deep, about 18 inches across, and about 30 feet long. The ground was completely filled with rock, so our bulging muscles were put to the test that day, and we left the site feeling totally exausted. The next couple days were spent constructing a cement wall that would serve as the foundation and bottom half of the fence. I've never mixed so much cement in my life! I've also never sweat so much in my life. It was so hot and humid that after a couple hours of work, each of us had sweat through about every inch of clothing we had on. In addition to the digging, mixing, and pouring of cement, our week consisted of a ton of painting (thanks Nick) and a ton of cutting of re-bar and steel for the fence. And yes Manuel, I know I took third place in the hacksaw competition. "Move the Bricks! Ha Ha Ha!" Most of the ladies spent their week serving in the school with the children. On the first day they were divided into classrooms, so throughout the week they were able to form relationships with the students in their class through playing games, singing songs, teaching English, learning Spanish, and playing soccer. About 2 or 3 times during the day the kids would crowd into a little gymnasium for a rousing game of futbol (soccer). These were great times of interaction with the kids as they looked forward to these games each day. The girls who worked in the classrooms had an incredible impact on the lives of the children they worked with all week. Often it is easy to be discouraged about our accomplishments when our achievements are not visible. In life we must continually operate with an eternal measuring stick rather than a worldly way of measuring success. We must know that most of what we do in the name of God will never be rewarded here on earth, but that God is very much aware of all we do for the Kingdom. May we keep the faith and keep pressing on, knowing that all we do for God, whether seen or unseen, is greatly impacting the world around us. I know it sounds cliche, but worshipping and serving in Panama really allowed me to understand that God is present everywhere and is being worshipped everywhere. The first morning was a Sunday and the team had the chance to worship with all the Methodist churches in the area, all at one unity service. This was a very powerful time of music, dance, and spoken word. Even though we could not understand much of what was sung and said, it was moving to know that there are followers of Jesus everwhere and they all worship the same God. Some of the hymns and worship choruses were familiar so we were able to understand the meaning because we knew the English lyrics. On the following Sunday, the team was able to worship twice on the beach of the Pacific Ocean, once in the morning and once in the evening. These were powerful times to really experience God's creation first-hand, to witness the vast ocean and know that God is infinitely larger than that. One thing God is continuing to teach me is how easy it is to compartmentalize our lives and our faith. It is so easy to act one way at one time and another later. If God has called us into leadership, we must recognize that we are called to be a leader 24-7, no matter who is around. We also must realize that God has called us into a lifetime of service and mission work, not just a week or two at a time. Whether we are serving at a church in Panama, or relaxing on the beaches of Panama, we must always carry an attitude of worship and service. Let's not continue to be Sunday morning worshippers who "praise God with our lips but walk out the door and deny Him with our lifestyles." Let us not continue to be mission trip servants who completely ignore the injustice in our world the entire rest of the year. God has called us to so much more!! Throughout my life, I have tried my very best to erase stereotypes. Today, ironically, that was not able to happen. I had never ridden in a cab before, so I was simply basing my knowledge of taxis and their drivers on what I had seen on tv and movies. Typically, on tv, a taxi driver is someone from a different country whose cab smells and is decorated with items from their home country. In addition, tv cabbies are typically terrible drivers, anxious to honk their horn and cut people off while going 20 mph over the speed limit. This picture became very real to me today in Chicago. As I waited for my cab, I watched countless American cab drivers pass by, but sure enough, when mine arrived, the man was from India. His cab was decorated with all sorts of Indian material and reaked of smoke. Then we started driving. Within a minute he was on the horn and must have cut off nearly 10 people in the 20 minute drive. Also, he was traveling the freeway at 80 in a 55 mph zone. But I survived and now have another story to tell. He must have been an okay driver as I remain in one piece!! I know it has been out on DVD for quite a while (I must not be as "hip" as I use to be) but Mandy and I just saw "Cinderella Man" for the first time last night. This was an incredible movie. It is rated PG-13 for some language and boxing scenes, but definitely worth a movie rental. The movie was set in the Great Depression of the 1930's and had tons to say about survival and family and making it through tough times. The main theme of the movie, though, was about heroes and rallying behind a cause and not giving up despite the obstacles. In the end, Russell Crowe's character, James J. Braddock, has the opportunity to literally "throw in the towel," but he recognizes he is not simply fighting for himself, but he is providing hope for an entire nation in despair. May you recognize the people in your life that are looking to you for hope in the midst of their own despair and live life to the full (John 10:10) in order to provide them with hope. Jesus calls us to be the light of the world, a city on a hill. Let your light shine down in the darkness and bring hope to all those around you.